The New Democratic Party (NDP; French: Nouveau Parti démocratique, NPD) is a social democratic federal political party in Canada. The party was founded in 1961 out of the merger of the Co-operative Commonwealth Federation (CCF) with the Canadian Labour Congress (CLC). On the Canadian political scene, the party sits to the left of the Liberal Party. Since 2017, the NDP has been led by Jagmeet Singh. The federal and provincial (or territorial) level NDPs are more integrated than other political parties in Canada, and have shared membership (except for the New Democratic Party of Quebec). Often the third- or fourth-largest party in Canada's House of Commons, the NDP has never been in power at federal level, but it has attained second-largest party status once. Following the 1993 election the NDP was reduced to fourth place behind the Bloc Québécois, a position it would maintain for the next 18 years. In the 2011 election under the leadership of Jack Layton, the NDP won the second most seats in the House, gaining the position of Official Opposition for the first time in the party's history. The NDP subsequently lost 59 seats in the 2015 federal election and fell to third place in Parliament, though it is their second-best seat count to date. 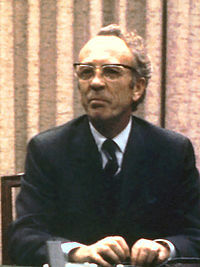 At the 1971 leadership convention, an activist group called The Waffle tried to take control of the party, but were defeated by David Lewis with the help of the union members. The following year, most of The Waffle split from the NDP and formed their own party. The NDP itself supported the minority government formed by the Pierre Trudeau–led Liberals from 1972 to 1974, although the two parties never entered into a coalition. Together they succeeded in passing several socially progressive initiatives into law such as pension indexing and the creation of the crown corporation Petro-Canada. The second was Trudeau's Canada Bill to patriate the Constitution of Canada unilaterally and to bring about what would become the Canadian Charter of Rights and Freedoms. Broadbent endorsed the initiative, which was directly opposed by the NDP government of Saskatchewan and many of the party's Western parties and members, creating severe internal tension. Broadbent would act as a moderating influence on Trudeau during the debates, and the eventual compromise that brought about the Constitution Act, 1982 was partially authored by Saskatchewan NDP Attorney General and future premier Roy Romanow. The NDP set a then-record of 43 Members of Parliament (MPs) elected to the house in the election of 1988. The Liberals, however, had reaped most of the benefits of opposing free trade to emerge as the dominant alternative to the ruling government. In 1989, Broadbent stepped down after 14 years as federal leader of the NDP. At the party's leadership convention in 1989, former B.C. Premier Dave Barrett and Yukon MP Audrey McLaughlin were the main contenders for the leadership. During the campaign, Barrett argued that the party should be concerned with western alienation, rather than focusing its attention on Quebec. The Quebec wing of the NDP strongly opposed Barrett's candidacy, with Phil Edmonston, the party's main spokesman in Quebec, threatening to resign from the party if Barrett won. McLaughlin ran on a more traditional approach, and became the first woman to lead a major Federal political party in Canada. McDonough announced her resignation as party leader for family reasons in June 2002 (effective upon her successor's election), and was succeeded by Jack Layton in January 2003. A Toronto city councillor and recent President of the Federation of Canadian Municipalities, Layton was elected at the party's leadership election in Toronto on January 5, 2003, defeating his nearest rival, longtime Winnipeg-area MP Bill Blaikie, on the first ballot with 53.5% of the vote. Despite early campaign polls which showed an NDP lead, the party lost 59 seats on election night and fell back to third place in Parliament. By winning 44 seats Mulcair was able to secure the second best showing in the party's history, winning one more seat than Ed Broadbent managed in the 1988 election, but with a smaller share of the popular vote. During the election campaign, Mulcair's stance on the niqab issue contributed to a decline in the party's support in Quebec; NDP seat gains in Saskatchewan and British Columbia were offset by numerical losses in almost every other region, while in Alberta and Manitoba the party simply held on to its existing seats without gaining or losing. The party was locked out of the Atlantic Region and the Territories, and lost over half of its seats in Ontario including all of its seats in Toronto. In Quebec the NDP lost seats to all three of the other major parties, namely the Liberals, Conservatives, and Bloc Québécois, though it managed to place second in both vote share (25.4%) and seats (16) behind the Liberals, who formed a majority government. Mulcair's leadership faced criticism following the election, particularly due to a moderate platform that the party was running on and Mulcair's promise to balance the federal budget while Liberal leader Justin Trudeau was promising to run a budget deficit in order to fund stimulus programs and higher social spending, a position which was perceived as allowing the Liberals to outflank the NDP on the left. Mulcair lost a leadership review vote held at the NDP's policy convention in Edmonton, Alberta on April 10, 2016. Consequently, his successor was to be chosen at a leadership election to be held no later than October 2017 (but Mulcair chose to remain as interim leader until then). On October 1, 2017 Jagmeet Singh won the leadership vote to head the party. The NDP evolved in 1961 from a merger of the Canadian Labour Congress (CLC) and the Co-operative Commonwealth Federation (CCF). The CCF grew from populist, agrarian and socialist roots into a modern social democratic party. Although the CCF was part of the Christian left and the Social Gospel movement, the NDP is secular and pluralistic. It has broadened to include concerns of the New Left, and advocates issues such as LGBT rights, international peace, and environmental stewardship. 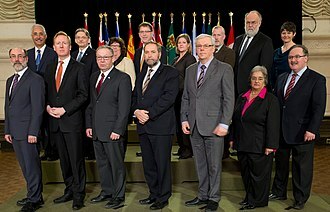 Before 2011, the party had been a stable presence in the Canadian parliament, and was the third largest political party from 1961 to 1993, when the party lost official status. The NDP's peak period of policy influence in those periods was during the minority Liberal governments of Lester B. Pearson (1963–68) and Pierre Trudeau (1972–74). After reattaining official party status in 1997, the NDP played a similar role in the Liberal and Conservative minority governments of 2004–2006 and 2006-2011, respectively. Provincial New Democratic parties, which are organizationally sections of the federal party, have governed in six of the ten provinces and a territory. The NDP governs the provinces of Alberta and British Columbia, forms the Official Opposition in Manitoba, Saskatchewan, and Ontario, and have sitting members in every provincial legislature except those of Quebec, New Brunswick, and Prince Edward Island. The NDP has previously formed the government in the provinces of Manitoba, Ontario, Saskatchewan, British Columbia, Nova Scotia and the Yukon Territory. While members of the party are active in municipal politics, the party does not organize at that level. For example, though former Toronto mayor David Miller was an NDP member during his successful 2003 and 2006 mayoral campaigns, his campaigns were not affiliated with the NDP. The NDP was affiliated with the Socialist International from 1961 until 2018. It is currently affiliated with the Progressive Alliance. There have been three exceptions: Nunavut, the Northwest Territories, and Quebec. In Nunavut and in the Northwest Territories, whose territorial legislatures have non-partisan consensus governments, the federal NDP is promoted by its riding associations, since each territory is composed of only one federal riding. In Quebec, the historical New Democratic Party of Quebec and the federal NDP agreed in 1989 to sever their structural ties after the Quebec party adopted the sovereigntist platform. From that time the federal NDP was not integrated with a provincial party in that province; instead, it had a section, the Nouveau Parti démocratique-Section Québec/New Democratic Party Quebec Section, whose activities in the province were limited to the federal level, whereas on the provincial level its members were individually free to support or adhere to any party. However, following the 2011 election, it was announced the NDP planned on recreating a provincial party in Quebec in time for the following Quebec general election. While the party was registered with the Chief Electoral Officer of Quebec, it failed to nominate any candidates. The federal NDP restarted the Quebec party before the 2014 general election; a modern party was registered on January 30, 2014, as Nouveau Parti démocratique du Québec, although it is not affiliated to the federal NDP due to provincial laws in Quebec which disallow provincial parties from affiliating with federal parties. The modern party was registered on 30 January 2014. The 2011 federal election gave the NDP 103 seats. Following the death of Jack Layton and the defection of Saint-Maurice—Champlain MP Lise St-Denis to the Liberal Party, they were reduced to 101; Craig Scott's victory in the by-election to succeed Layton brought the party caucus back to 102 members, but they returned to 101 with the decision of Thunder Bay—Superior North MP Bruce Hyer to sit as an independent. On February 28, 2013, Claude Patry of Jonquière—Alma defected to the Bloc Québécois bringing seats held to 100 members. Olivia Chow, MP for Trinity—Spadina, resigned her seat on March 12, 2014 to run for mayor of Toronto. Manon Perreault became an independent. Sana Hassainia left the party to sit as an independent on August 20, 2014, citing a policy dispute over the Israeli–Palestinian conflict. Jean-François Larose left the party to form the political party, Strength in Democracy, with former Bloc Québécois MP Jean-Francois Fortin. Adam Giambrone 2001–2006 At age 24, he was the youngest person to ever become president of a political party. Toronto City Councillor for the latter part of his term. Anne McGrath 2006 – 2009 McGrath was elected at the 2006 party convention in Quebec City. Served as Chief of Staff to Jack Layton (2008–2011). Peggy Nash 2009 – 2011 Elected at the 2009 party convention in Halifax, Nova Scotia. MP for Parkdale—High Park prior to and following her term. Brian Topp 2011 Resigned after three months to run for leader of the NDP following the death of Jack Layton. National Campaign Director in 2006 and 2008. Subsequently, chief of staff to Alberta NDP Premier Rachel Notley. 18 Marit Stiles 2016–2018 Toronto School Trustee. Member of Ontario Provincial Legislature since 2018. ^ Neville, William (August 3, 1961). "Douglas Leads New Party, 'Democratic' Tag in Name". The Vancouver Sun. Vancouver. UPI. p. 1. Retrieved August 22, 2011. ^ Éric Grenier (August 29, 2017). "NDP triples its membership to 124,000 in run-up to party's leadership vote". Cbc.ca. Retrieved October 4, 2017. Richard Collin; Pamela L. Martin (2012). An Introduction to World Politics: Conflict and Consensus on a Small Planet. Rowman & Littlefield. p. 209. ISBN 978-1-4422-1803-1. Retrieved July 18, 2013. ^ William Cross (September 2012). "The Canadian New Democratic Party: A New Big Player in Canadian Politics?" (PDF). Friedrich Ebert Stiftung. Retrieved January 2, 2019. ^ Jessica Murphy (September 26, 2017). "Who will Canada's New Democrats pick to take on Trudeau?". BBC News. Retrieved January 2, 2019. ^ Gerard Di Trolio (June 4, 2018). "The NDP Claws Its Way Back". Jacobin. Retrieved January 2, 2019. ^ David McGrane (2018). "Electoral competition in Canada among the centre-left parties: liberal versus social democrats". In Rob Manwaring; Paul Kennedy (eds.). Why the Left Loses: The Decline of the Centre-Left in Comparative Perspective. Policy Press. pp. 39–52. ISBN 978-1-4473-3266-4. ^ "Canada's New Democrats elect Jagmeet Singh as party leader". BBC News. October 2, 2017. Retrieved December 31, 2018. ^ How Canada's politics are different to Australia's. ABC. Author - Annabelle Quince. Published 16 October 2015. Retrieved 2 January 2019. ^ a b Andrea Olive (2015). The Canadian Environment in Political Context. University of Toronto Press. p. 55. ISBN 978-1-4426-0871-9. ^ "Parties & Organisations of the Progressive Alliance". progressive-alliance.info. Retrieved October 6, 2018. ^ Pamela Behan (2012). Solving the Health Care Problem: How Other Nations Succeeded and Why the United States Has Not. SUNY Press. pp. 15–16. ISBN 978-0-791-48135-6. ^ Elizabeth Goodyear-Grant (2013). Gendered News: Media Coverage and Electoral Politics in Canada. UBC Press. p. 31. ISBN 978-0-7748-2625-9. ^ David Martin Thomas; David Biette (2014). Canada and the United States: Differences that Count, Fourth Edition. University of Toronto Press. p. 168. ISBN 978-1-4426-0908-2. ^ Marc Guinjoan (2014). Parties, Elections and Electoral Contests: Competition and Contamination Effects. Ashgate. p. 62. ISBN 978-1-4724-3910-9. ^ "David Lewis - Federal NDP Leader 1971-75 - Biography of David Lewis". Canadaonline.about.com. Retrieved March 28, 2011. ^ "CBC News Indepth: Ed Broadbent". Cbc.ca. Retrieved September 17, 2015. ^ J. T. Morley. "Barrett, David". Thecanadianencyclopedia.com. Retrieved March 28, 2011. ^ "CBC News Indepth: Budget 2005". Cbc.ca. June 24, 2005. Retrieved June 4, 2014. ^ "Income trust a major campaign turning point". CTV.ca. January 22, 2006. Archived from the original on March 2, 2006. Retrieved March 28, 2011. ^ "Canada News Centre - Centre des nouvelles du Canada". News.gc.ca. September 29, 2008. Retrieved March 28, 2011. ^ "Goodale cleared in trust case". Canada.com. February 16, 2007. Archived from the original on February 14, 2012. Retrieved March 28, 2011. ^ "Harper agrees to send Clean Air Act to committee". Cbc.ca. November 1, 2006. Retrieved June 4, 2014. ^ François Lauzon (August 25, 2011). "Did sovereignist Lepage opened doors for Jack Layton?". Montreal Gazette. Retrieved October 15, 2011. ^ "NDP leadership convention: Thomas Mulcair holds on for victory". Vancouver Sun. March 24, 2012. Archived from the original on March 28, 2012. Retrieved March 24, 2012. ^ Elizabeth McSheffrey (October 21, 2015). "Better luck next time, Mr. Mulcair". National Observer. Retrieved October 23, 2015. ^ "Jagmeet Singh wins leadership of federal NDP on first ballot". Cbc.ca. Retrieved October 4, 2017. ^ Bob Stewart (1983). "The United Church of Canada in British Columbia" (PDF). Retrieved April 15, 2011. ^ a b c d e f Quadri, Omair (October 13, 2015). "Platform comparison: Where the parties stand on the top campaign issues". The Globe and Mail. Retrieved October 17, 2015. ^ Fedio, Chloe (June 11, 2015). "NDP Leader Tom Mulcair says he'll seek mandate for Senate abolition". CBC News. Retrieved October 17, 2015. ^ a b NDP convention: A new preamble is approved. Macleans.ca (2013-04-14). Retrieved on 2014-04-12. ^ Dehaas, Jeff (August 14, 2015). "Fact Check: NDP and Liberals on the $15 minimum wage". CTV News. Retrieved October 17, 2015. ^ O'Malley, Kady (December 3, 2014). "NDP bid to endorse proportional representation to be free vote for Liberals". CBC News. Retrieved October 17, 2015. ^ Bolen, Michael (August 21, 2015). "Mulcair pledges NDP will decriminalize pot 'the minute we form government'". CBC News. Retrieved October 17, 2015. ^ "NDP votes to take socialism out of party constitution". CBC. ^ a b "Constitution of the New Democratic Party of Canada, Effective April 2013" (PDF). New Democratic Party of Canada. ^ "Nouveau Parti Démocratique | Nouveau Parti Démocratique Section Québec". Npd.qc.ca. March 31, 2010. Archived from the original on April 20, 2010. Retrieved April 28, 2010. ^ "NDP coming to Quebec for next election". CBC News. August 17, 2012. Retrieved August 17, 2012. ^ a b "Nouveau Parti démocratique du Québec". DGE. Retrieved March 5, 2014. ^ a b Greenaway, Kathryn; August 29, Montreal Gazette Updated:; 2018 (August 29, 2018). "NDPQ candidates head out on campaign trail in West Island - Montreal Gazette". Retrieved March 20, 2019. ^ Graham, Jennifer (October 20, 2015). "NDP hopes for major gains in Saskatchewan dashed by Conservatives". CityNews. The Canadian Press. Retrieved July 28, 2016. ^ "Good news story, bad news story: the NDP in Saskatchewan". CBC News. October 20, 2015. Retrieved July 28, 2016. ^ "NDP MP Lise St-Denis jumping to Liberals". CBC News. January 10, 2012. Retrieved January 10, 2012. ^ "Le NPD perd un autre député au Québec". ICI.Radio-Canada.ca. August 20, 2014. Retrieved April 25, 2017. ^ "Ex-BQ, NDP MPs form new federal party". cbc.ca. Retrieved October 12, 2016. ^ Connor, Kevin (April 15, 2011). "Sun News talking the talk". Toronto Sun. Retrieved December 23, 2012. ^ "Anne McGrath elected NDP President" (Press release). New Democratic Party. September 10, 2006. Archived from the original on September 30, 2008. Retrieved August 26, 2011. ^ Galloway, Gloria (August 15, 2009). "Folksy Dexter plays the hero". The Globe and Mail. Toronto. Retrieved September 22, 2009. ^ Smith, Joanna (June 19, 2011). "Heated debate as New Democrats defer motion to drop socialist from constitution". The Toronto Star. Toronto. Archived from the original on June 25, 2011. Retrieved June 25, 2011. ^ Bryden, Joan (March 26, 2012). "NDP hunts for source of cyber-attack on electronic voting system". The Globe and Mail. The Canadian Press. Retrieved March 31, 2012.